Brooks is an English surname, but there is no definitive proof of our family's whereabouts in England before their migration to the New World. The name is usually a derivation of the word brook, or a small stream. Many Brooks lines are also supposed to have been traced to a place in England called Brooksbank. Recent DNA evidence has suggested that our earliest known Brooks, Henry Brooks (c.1592-1683) was likely from the area of Manchester, Lancashire, England. Please visit Christopher Brooks' excellent website, Tributaries, which provides well-researched genealogies on the many Brooks families of New England, and links to DNA results. Henry Brooks was born circa 1592 in England. He died on April 12, 1683 in Woburn, Middlesex Co., Massachusetts 13. DNA evidence has shown that Henry is likely closely related to a Richard Brooke who died in 1607 in Manchester, England. Henry was likely the son of John Brooke, who was a son of Richard Brooke of Manchester. Henry emigrated with his family to New England at an unknown date, probably in the 1630's. He was first found living in 1639 in Concord, Massachusetts, when he was made a freeman. He was still living in Concord as late as 1641, when his son was born there. Sometime between 1641 and 1649, Henry and his family moved to Woburn, Massachusetts, where they remained. In Woburn, Henry was a landowner and was described as both a yeoman (farmer) and clothier. He wrote his will on July 18, 1682 (just 6 days after his third marriage). For more information, please see Christopher Brooks' well researched page at Tributaries. Henry married first name unknown before 1622, probably in England. She was born circa 1590's in England and died probably between 1643 and 1651, either in Concord or Woburn, Massachusetts. 1 Hannah Brooks was born circa 1622 in England. She died in 1692 in New London, New London Co., Connecticut. She married Thomas Fox on December 13, 1647 in Concord, Middlesex Co., Massachusetts 23. She married second Andrew Lester in 1661 in New London, New London Co., Connecticut. She married third Isaac Willey sometime between 1669 and 1692 in New London, New London Co., Connecticut. 3 Martha Brooks was born circa 1626 in England. She died on August 3, 1665 in Concord, Middlesex Co., Massachusetts 23. She married Thomas Bateman before 1645. 4 Mary Brooks was born circa 1630 in England. She died on February 24, 1671/72 in Watertown, Middlesex Co., Massachusetts. She married Richard Norcross on June 24, 1650 in Watertown, Middlesex Co., Massachusetts. 5 Sarah Brooks was born circa 1633 in England. She died before September 10, 1705 in Woburn, Middlesex Co., Massachusetts. She married John Mousall on May 13, 1650 in Woburn, Middlesex Co., Massachusetts 13. He died on April 2, 1698 in Woburn, Middlesex Co., Massachusetts 13. 6 Timothy Brooks was born circa 1635 in England. He died before October 7, 1712 in Salem (now Cumberland) Co., New Jersey. He married first Mary Russell on December 2, 1659 in Woburn, Middlesex Co., Massachusetts 13. She died on September 15, 1680 in Billerica, Middlesex Co., Massachusetts. He married second Mehitabel Mowry, widow of Eldad Kinsley, circa 1680-1681 in Swansea, Bristol Co., Massachusetts. 7 Joseph Brooks was born on April 12, 1641 in Concord, Middlesex Co., Massachusetts 23. He died before 1682. 8 Isaac Brooks was born circa 1643 in Concord or Woburn, Massachusetts. He died on September 8, 1686 in Woburn, Middlesex Co., Massachusetts 13. He married Miriam Daniels on January 10, 1665/66 in Woburn, Middlesex Co., Massachusetts 13. Henry married second Susanna, widow of Ezekiel Richardson, before March 27, 1651 in Woburn, Middlesex Co., Massachusetts. She died on September 15, 1681 in Woburn, Middlesex Co., Massachusetts 13. Henry married third Annis Jordan, widow of Abraham Jaquith, on July 12, 1682 in Woburn, Middlesex Co., Massachusetts 13. John Brooks was born circa 1623 in England. He died on September 29, 1691 or September 29, 1692 7 in Woburn, Middlesex Co., Massachusetts. John was admitted as freeman in 1651. John married Eunice Mousall on November 1, 1649 in Woburn, Middlesex Co., Massachusetts 7. She was born circa 1625-1630 in England. She died on January 1, 1683/4 in Woburn, Middlesex Co., Massachusetts 7,13. 1 John Brooks was born on November 23, 1650 in Woburn, Middlesex Co., Massachusetts 13. He died on November 22, 1653 in Woburn, Middlesex Co., Massachusetts 13. 2 Sarah Brooks was born on November 21, 1652 in Woburn, Middlesex Co., Massachusetts 13. She died in 1720 in Woburn, Middlesex Co., Massachusetts. She married Ephraim Buck on January 1, 1669/70 in Woburn, Middlesex Co., Massachusetts. We also descend from this child. Her granddaughter Mary Buck (1712-1773) married Samuel Bixby. 3 Eunice Brooks was born on October 10, 1655 in Woburn, Middlesex Co., Massachusetts 13. She married first James Parker circa 1672. She married second Samuel Carter. 4 Joanna Brooks was born on March 22, 1658/9 in Woburn, Middlesex Co., Massachusetts 13. She died on Decdember 1, 1724 in Woburn, Middlesex Co., Massachusetts. She married David Roberts on October 2, 1678 in Woburn, Middlesex Co., Massachusetts. 6 Ebenezer Brooks was born on December 9, 1666 in Woburn, Middlesex Co., Massachusetts 13. 7 Deborah Brooks was born on March 20, 1668/9 in Woburn, Middlesex Co., Massachusetts 13. She died on February 12, 1703/4 in Woburn, Middlesex Co., Massachusetts. She married John Richardson circa 1689 in Woburn, Middlesex Co., Massachusetts. 8 Jabez Brooks was born on July 17, 1673 in Woburn, Middlesex Co., Massachusetts 13. He died on January 30, 1746/7 in Woburn, Middlesex Co., Massachusetts. He married first Rachel Buck on December 18, 1694 in Woburn, Middlesex Co., Massachusetts. He married second Hepzibah Cutter on June 7, 1698 in Woburn, Middlesex Co., Massachusetts. John Brooks was born on March 1, 1663/4 in Woburn, Middlesex Co., Massachusetts 7,13. He died on August 7, 1733 in Woburn, Middlesex Co., Massachusetts 7,13. John was married there on December 30, 1684 to Mary Bruce. They lived in Woburn and had 11 children: Mary, John, Ebenezer, Mary, Elizabeth, Sarah, John, Abigail, Timothy, Isaac, and Nathan (see next generation). John died on August 7, 1733 at Woburn, Mass., and his wife died after 1734. John married Mary Bruce on February 25, 1683/64 7 or December 30, 1684 in Woburn, Middlesex Co., Massachusetts. She was born on June 15, 1665 in Woburn, Middlesex Co., Massachusetts 13 and died after 1734. 1 Mary Brooks was born and died on December 4, 1685 in Woburn, Middlesex Co., Massachusetts 13. 2 John Brooks was born on December 30, 1686 in Woburn, Middlesex Co., Massachusetts 13. He died on January 2, 1686/7 in Woburn, Middlesex Co., Massachusetts 13. 3 Ebenezer Brooks was born on December 30, 1686 in Woburn, Middlesex Co., Massachusetts 13. He died on December 31, 1686 in Woburn, Middlesex Co., Massachusetts 13. 4 Mary Brooks was born on April 1, 1688 in Woburn, Middlesex Co., Massachusetts 13. She died on May 26, 1712. 5 Elizabeth Brooks was born circa 1690 in Woburn, Middlesex Co., Massachusetts. She died on April 14, 1724 in Woburn, Middlesex Co., Massachusetts. 6 Sarah Brooks was born on August 14, 1692 in Woburn, Middlesex Co., Massachusetts 13. 7 John Brooks was born on November 28, 1694 in Woburn, Middlesex Co., Massachusetts 13. 8 Abigail Brooks was born on August 19, 1697 in Woburn, Middlesex Co., Massachusetts 13. She died on October 12, 1697 in Woburn, Middlesex Co., Massachusetts 13. 9 Timothy Brooks was born on February 14, 1699/00 in Woburn, Middlesex Co., Massachusetts 13. He died on October 13, 1786. 10 Isaac Brooks was born in 1703 in Woburn, Middlesex Co., Massachusetts 13. He died on August 24, 1719 in Woburn, Middlesex Co., Massachusetts 13. Nathan Brooks was born on November 1, 1706 in Woburn, Middlesex Co., Massachusetts 7,13. He died on January 5, 1750/1 13 or January 6, 1750/1 7,15 in Woburn, Middlesex Co., Massachusetts. He is buried in the Old Burial Ground, Woburn, Middlesex Co., Massachusetts. Nathan married Sarah Wyman circa 1726 in Woburn, Middlesex Co., Massachusetts 7. She was born on August 18, 1706 in Woburn, Middlesex Co., Massachusetts. She died on February 21, 1746/7 in Woburn, Middlesex Co., Massachusetts 7,13,15. She is buried in the Old Burial Ground, Woburn, Middlesex Co., Massachusetts. 1 Nathan Brooks was born on November 6, 1727 in Woburn, Middlesex Co., Massachusetts 13. He died on January 26, 1758 in Woburn, Middlesex Co., Massachusetts. 2 Isaac Brooks was born on July 31, 1729 in Woburn, Middlesex Co., Massachusetts 13. He died on March 23, 1768 in Woburn, Middlesex Co., Massachusetts 13. 3 Jonathan Brooks was born on August 26, 1731 in Woburn, Middlesex Co., Massachusetts 13. He died on December 30, 1733 in Woburn, Middlesex Co., Massachusetts 13. 5 Jonathan Brooks was born on February 21, 1734/5 in Woburn, Middlesex Co., Massachusetts 13. He died in 1807. 6 William Brooks was born on March 3, 1736/7 in Woburn, Middlesex Co., Massachusetts 13. He died on October 11, 1804 in Lyndeboro, Hillsborough Co., New Hampshire. 7 Sarah Brooks was born on March 1, 1738/9 in Woburn, Middlesex Co., Massachusetts 13. 8 Seth Brooks was born on April 1, 1740 in Woburn, Middlesex Co., Massachusetts 13. 9 Zachariah Brooks was born on April 20, 1742 in Woburn, Middlesex Co., Massachusetts 13. He died on February 2, 1792 in Woburn, Middlesex Co., Massachusetts. 10 Mary Brooks was born on March 1, 1743/4 in Woburn, Middlesex Co., Massachusetts 13. 11 Elizabeth Brooks was born in 1746 in Woburn, Middlesex Co., Massachusetts 13. 12 Samuel Brooks was born on July 16, 1747 in Woburn, Middlesex Co., Massachusetts. John Brooks was born on May 6, 1733 in Woburn, Middlesex Co., Massachusetts 13. He died on May 6, 1776 in Hollis, Hillsborough Co., New Hampshire 16. He is buried in the a Congregational Church Cemetery, Hollis, Hillsborough Co., New Hampshire. John left his family as a youth and moved to Hollis, New Hampshire. There he married Mary Kemp on January 5, 1757. They had 5 children: Mary, John, Nathan (see next generation), Abigail, and Ruth. John continued living in Hollis where he died on May 6, 1776. His widow afterwards moved to nearby Hancock, New Hampshire, where she died on February 12, 1829. 1 Mary Brooks was born on December 3, 1757 in Hollis, Hillsborough Co., New Hampshire 9. 2 John Brooks was born on August 24, 1760 in Hollis, Hillsborough Co., New Hampshire 7,9. He died on June 12, 1851 in Hancock, Hillsborough Co., New Hampshire 7. 4 Abigail Brooks was born on December 6, 1770 in Hollis, Hillsborough Co., New Hampshire 9. She died on January 5, 1771 in Hollis, Hillsborough Co., New Hampshire. She is buried in the Congregational Church Cemetery, Hollis, Hillsborough Co., New Hampshire. 5 Hannah Brooks was born on August 20, 1772 in Hollis, Hillsborough Co., New Hampshire 9. She died after 1850, probably in Licking Co., Ohio. She married John Powers on November 28, 1793 in Hollis, Hillsborough Co., New Hampshire. 6 Ruth Brooks was born on January 15, 1775 in Hollis, Hillsborough Co., New Hampshire 9. She died in 1790 in Hollis, Hillsborough Co., New Hampshire. Nathan Brooks was born on August 26, 1767 in Hollis, Hillsborough Co., New Hampshire 7,9,10. He died on March 1, 1826 in Granville, Licking Co., Ohio 1,7,10. He is buried in the Old Colony Burial Ground, Granville, Licking Co., Ohio. Nathan was born and raised in the town of Hollis, where his father died when he was only eight years old. He was afterwards raised by his mother and step-father Nehemiah Woods. In 1795, Nathan married a young woman named Sarah Morse and the two settled immediately in the nearby town of Hancock, New Hampshire. They did not remain there long. In 1802, the family moved to Westford, Chittenden County, Vermont 7. In 1817, Nathan and his family moved yet again to Licking County, Ohio 7. Nathan spent the remainder of his life in the vicinity of Granville, Ohio. It seems that the family lived and farmed on land in McKean Township, not far from the village of Granville. Nathan died in 1826 and was buried in the Old Colony Burial Ground at Granville. His tombstone was standing and recorded in 1886, but has disappeared by 2004. Nathan married Sarah Morse on September 17, 1795 in Dublin, Cheshire Co., New Hampshire 8,10. She was born on January 12, 1777 in Dublin, Cheshire Co., New Hampshire 3,7,10. She died on August 19, 1863 in St. Paul, Ramsey Co., Minnesota 7,10. She is buried in the Oakland Cemetery, St. Paul, Ramsey Co., Minnesota. After the death of her husband in 1826, Sarah lived with the family of her daughter Mary Brooks Thurston in Licking County, Ohio. She moved with them to Delaware County, Ohio in the 1830's and again to Garden City, Minnesota in 1856. In the early 1860's, she moved to St. Paul, Minnesota, probably to live with her son Cyrus. 1 Nathan Brooks was born on September 10, 1796 in Hancock, Hillsborough Co., New Hampshire 5,7. He died on October 20, 1854 7 or October 29, 1854 5 in Columbus, Franklin Co., Ohio . He is buried in the Green Lawn Cemetery, Columbus, Franklin Co., Ohio. 2 Sarah Brooks was born on July 25, 1798 in Hancock, Hillsborough Co., New Hampshire 8. She died on August 25, 1800 in Hancock, Hillsborough Co., New Hampshire 8. 3 Sarah Brooks was born on February 15, 1801 in Hancock, Hillsborough Co., New Hampshire 7. She died on March 22, 1884 in Kingman, Kingman Co., Kansas 7. She is buried in the Corinth Cemetery, Chariton Co., Missouri. 5 John Brooks was born on July 25, 1805 in Westford, Chittenden Co., Vermont 8. He died on August 30, 1809 in Westford, Chittenden Co., Vermont 8. 6 Miles Brooks was born on May 4, 1808 in Westford, Chittenden Co., Vermont 8. He died on August 29, 1809 in Westford, Chittenden Co., Vermont 8. 7 Cyrus Brooks was born on February 8, 1811 in Westford, Chittenden Co., Vermont 7. He died on April 21, 1902 in St. Paul, Ramsey Co., Minnesota 8. He is buried in the Oakland Cemetery, St. Paul, Ramsey Co., Minnesota. 8 Harrison Brooks was born on April 13, 1813 in Westford, Chittenden Co., Vermont 7. He died on February 28, 1881 in Clarion, Wright Co., Iowa 7,8,11. He is buried in the Evergreen Cemetery, Clarion, Wright Co., Iowa. 9 Ancel Brooks was born on January 24, 1816 in Westford, Chittenden Co., Vermont 7. He died on July 25, 1906 in Washington Court House, Fayette Co., Ohio 17. He is buried in the Greenfield Cemetery, Greenfield, Highland Co., Ohio. Mary Morse Brooks was born on June 12, 1803 at Westford, Chittenden County, Vermont 2,7,8. She died on May 11, 1876 in Garden City, Blue Earth Co., Minnesota 2. She is buried in the Garden City Cemetery, Garden City, Blue Earth Co., Minnesota. In 1817 (when she was about 14) she moved with her family to Licking County, Ohio 7. There, she met and married Reuben H. Thurston in 1827. They lived near Granville in McKean Township, Licking County, Ohio. Sometime between 1834 and 1840, they moved to Berlin Township, in Delaware County, Ohio, where they lived near the city of Delaware. Mary's husband was a successful farmer in Ohio. Reuben was a member of the Ohio Abolitionists, with the goal to abolish slavery. He is also said to have discredited the Christian Bible, and there is no record of Mary or her children attending any church. 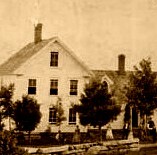 In the Spring of 1856, Mary and her family moved out west and settled at Garden City, in Blue Earth County, Minnesota, where they remained 22. In Minnesota, Mary apparently owned some real estate in her own name, as she was taxed for it in 1864. Mary married Reuben Harris Thurston on March 15, 1827 in Granville, Licking Co., Ohio 2,7,21. 2. Thurston, Brown. Thurston Genealogies, 1635-1892, Second Edition. Brown Thurston: Portland, ME, 1892. 3. Morse, J. Howard. Morse Genealogy. NY, 1903. 5. Online cemetery index, Green Lawn Cemetery, Columbus, OH. http://greenlawn.delaohio.com/greenlawn/Greenlawn/index.htm. 7. Hayward, William W. The History of Hancock, New Hampshire, 1764-1889. S.W. Huse & Co., Lowell, MA, 1889. 9. Worcester, Samuel T. History of the Town of Hollis, New Hampshire, from its settlement to the year 1879. A. Williams & Co., Boston, 1879. 13. Vital Records of Woburn, Massachusetts to the end of the year 1873. Tan Book, 1890. 14. Vital Records of Groton, Massachusetts, to the year 1849. The Essex Institute, Salem, MA, 1926. 23. Concord, Massachusetts Births, Marriages, and Deaths, 1635-1850. Beacon Press, Boston, 1895.